Are hub swaps cost effective? My wife's 88 Paramount came with six speed Dura Ace 7400. The wheels are MA40 with freewheel type dura-ace hubs. The six speed does not really work for my wife. So I have been SLOWLY collecting parts to make this bike a nine speed. But I am unsure what to do with the wheelset. Would that be a good idea? Is it really cost effective? Or should I just sell the wheels and buy comparable 8/9/10 speed wheels? If you're wanting to keep the front hub, and keep the rims, sure. But you can buy a new set of cassette wheels for $150-200, and with the prices you've specified, you're already at about $100 for the rear, which is what it'd cost to buy one new. I'd consider a hub swap if you were keeping the hubs and getting rid of the rims, but the other way around? Not really worth it, IMO. this is a typical conundrum for us CV folk. i think most people would say to buy a new wheelset and keep the old ones. I would keep the front wheel as is. 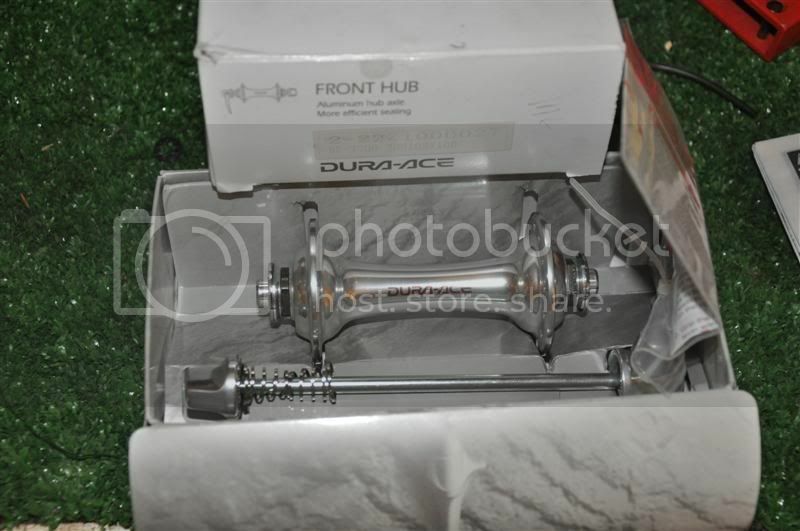 The reason I was going to look for a 7700 36h dura-ace 8/9/10 speed hub is that I thought it was the 8/9/10 speed hub that visually matched up best with the 7400 front hub. 36 hole MA40's are some very stout wheels, I once did several thousand miles of medium load touring on a similar wheelset and I am no lightweight myself. Unless your wife is a sumo wrestler, you would probably do well and take this opertunity to upgrade and get her an entirely new wheelset with fewer spokes and lighter rims. 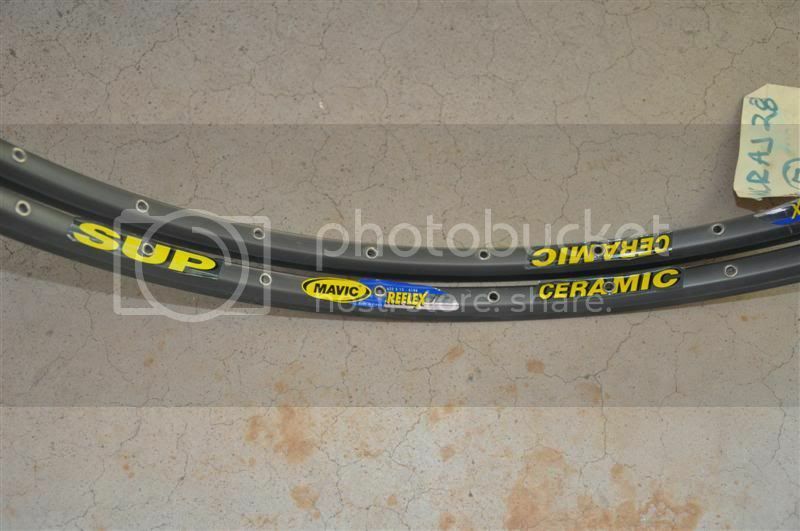 Keep the MA-40 wheelset intact and sell them or repurpose them on another bike. They could be re-spaced and re-dished for use as an 8-speed freewheel as a partial upgrade. Mis-matched rims/hubs/tires bug the ever-living snot out of me. I re-lace wheels all of the time based upon changing rims/hubs, but if you are not much on building wheels, new wheelset. Otherwize, replace BOTH hubs. I think this is one of those questions where the deciding factor is the cost of having it done, versus doing it yourself. I would get spokes for $20 or so, shipped, and build the wheel myself; having someone else do it would be too expensive for me. I understand your point about not being able, or not wanting, to do it yourself. We've all been there. But... well, if you're going to ask questions like "is it cost effective...?" then I suggest you learn to do it yourself. Building a wheel is pretty easy and, if you ask me, more fun than watching a ball game on TV. if I may be so bold as to ask, why doesn't 7spd work for your wife? granted I don't live in mountainous aera or ride more than 30mi at a time (Dr orders the sun you know ) and I don't notice a huge difference between my 7spd and 9 spd bikes. will you be looking to put a large cog on the rear or just taking advantage of the 1T spacing? as for what to do with the wheels, those look almost new. for a set of MA-40s w/ DA hubs in that shape you may break even, offering those in the sale threads and buying a new set of wheels. where are you buying spokes? they are $2+ ea at my shop. Any idea what a new Dura Ace hub wheelset costs? Probably more than the bike itself. Another consideration is frame spacing but with an '88, I think that you should be fine. Yes, its cost effective if you do it yourself and reuse the old spokes. I do it all the time. As someoen mentioned earlier, i'm a stickler for matched everything, rims, spokes, hubs, tires. Is it possible to simply replace the cassette body, respace the rear axle to 130mm and re-dish the wheel? That would be the approach that I would take...not sure if a more modern cassette body would fit on that hub, though. I like Bianchi Girl's 7-speed suggestion, plus a triple up front, if necessary. Most riders use 3-4 gears during a normal commute. The sweet spot for most riders is 15-21T @ the rear. Change to a smaller front chain ring if you need to climb a steep grade. A few clarifications. The MA40 wheelset is currently a freewheel wheelset. The rear hub has a six speed seven freewheel on it, not a seven speed cassette. If it was a cassette, I would be looking to do a hub body swap as that would solve my problem. But this one takes a freewheel. The desire to swap out the hub is driven by gearing. The six speed freewheel on the bike does not have much range, and there are significant hills where we like to ride. I turned her Turbo into an ultegra 6500 triple for the same reason. 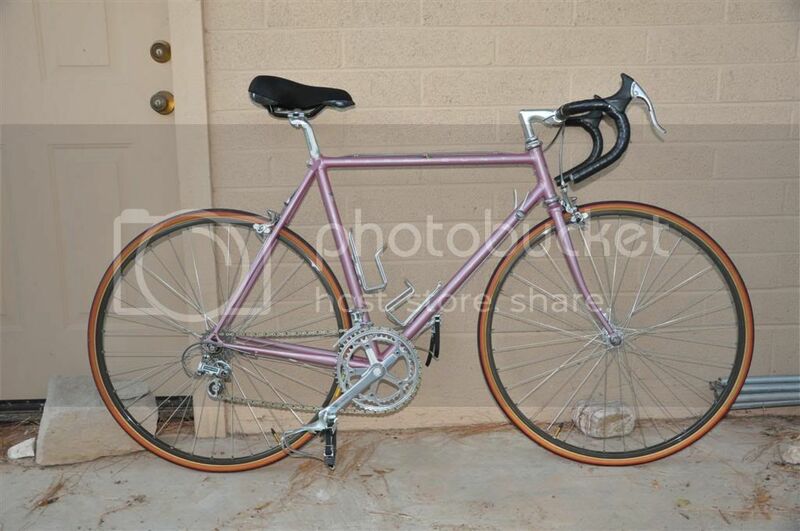 I have a 12-27 nine speed cassette and a pair of nine speed bar end shifters shifters waiting for this bike. I think that may be plenty for her. I understand the desire to be consistent in the wheelset. And I feel the same way. So maybe I should be looking for a 7400 cassette rear hub. I think 7400 hubs were freewheel in their early years (like this one) and became 8 speed cassette hubs in their later years. But presumably the front hubs were pretty close to unchanged? 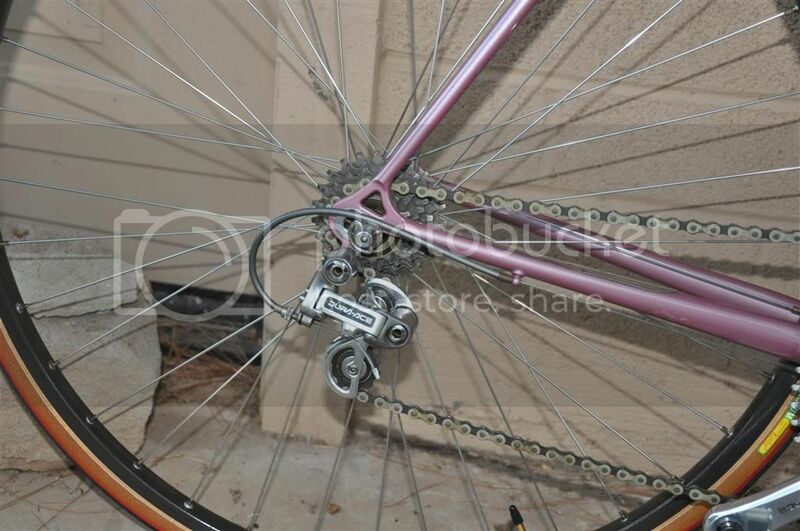 If I swapped a rear 7400 cassette hub into the rear wheel the wheels would presumably match pretty close. But one other thing-- GrayJay make a good point. These 36h wheels are really overkill for my wife. I should be riding these wheels. Replacing the rear cog to climb hill is a waste of $ since the rear shifter is most effective up to about 28-30T. A better approach is to keep the old rear cog and find a smaller front chain ring that will fit the crank's bolt-center-diameter. +3 You have a beautiful bike. I would want everything to match: hubs, spokes, tires and rims. Doing the work yourself, it is cost effective, particularly if you reuse everything (at that point, the only cost is for a set of new hubs). But if you are going to pay someone to do the work, I would just buy a replacement wheelset instead, and store these original wheels for the time that you might sell the bike. I have moved my "favorite" wheelset from bike to bike, as I keep changing my keeper fleet. Now if I had a Paramount that nice, I would probably be keeping it a really long time.... But I still like to have the original stuff for such a nice bike. If it was a lower end bike, I wouldn't sweat it. Realize for the cost of a new wheelset, you will end up with two wheelsets, the current ones, and the new set. If you have wheels built reusing the old stuff, you will only have one wheelset (and a spare hub). +1 Building wheels usually makes sense only if you do the work yourself. I have picked up some really nice 8/9/10 speed wheelsets used, for very attractive pricing. So that is also something to consider. +3 I would look for a smaller front ring first. Last edited by wrk101; 06-16-10 at 09:10 AM. If its increased gearing range you want, your biggest limiting factor on this bike is gonna be the Dura-Ace RD. Its got a max cog size of 26T and a Chain wrap capacity of 28T. You can generally push the stated limits a little, but I'd expect that you'll end up with at least a few gear combos that are gonna be a bit freaky. Not to mention, you're looking at going from a 23T (or 24, i might have counted wrong) big cog to a 27. Its gonna help but its not really a big difference. It kinda sounds to me like you're going to mostly be gaining more ratios rather than more range by moving to 9 speed, not to mention increasing the dish on the wheel and having slightly poorer chainline in crosschained gear combos. my .02 ....lose the Dura-Ace RD. Replace it with something like a Deore with a long cage, then swap out the freewheel for a 7 speed 13-32 (or 34) freewheel. You'll gain a lot more range and be able to keep your wheelset. 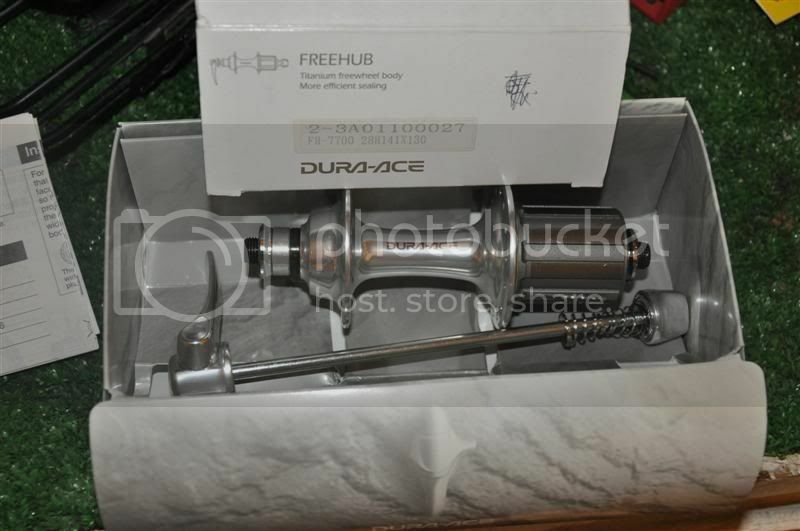 I run a 7 speed Sun-Race freewheel on my Dura-Ace 7400 hubs with no issues. If it were me, I would find a period correct 740X casset hub, make it 7-8 speed, replace the rear derailuer with a long cage of some sort, and go with a triple front as Bianchigirl suggested. That releases you from the cog limit on the rear end, and depending upon the crank choice, you may get 24-32 on the front end which should be able to tractor up just about anything unladen. I would prefer to keep some sort of period DA derailuer, but as Zaphood noted, chain wrap is going to make that difficult unless you significantly reduce the chainring differences, or limit your gear selections. I do not think they made a long-cage DA. Later model long-cage 600/Ultegra's limit out at 27/28 cog sizes, but this should be suitable with a triple front. One other option is a compact front end, say a 48-34. you could likely keep the DA derailuer, but you will have to see if the 34-26/28 gear ratio os low enough. I like this option better personnaly, but it ain't my bike. I think you guys have convinced me. I am not going to mess with these wheels. I think I will move to reconsidering Option 2 for this bike. I had originally decided to trade this stuff away because the 28h made me nervous. I have also posted these on the for trade thread. Last edited by sjpitts; 06-16-10 at 10:09 AM. ZB makes good points, Jared. I think the RD is limiting you more than the freewheel that's on there. I get that 36 spokes is overkill, though. But back in the day, that's what we ran... If you're looking to make this a retro style bike (modern drivetrain on older frame), then get a new set of wheels (or have some made) and get a long cage RD that will handle the gears you want to run. Also, if you change it over to 9 spd, aren't you going to have to have the rear triangle spread to better accommodate the 130? Seems like a lot of work & money when you could change out the RD and get a freewheel that will do what you want. The original question was only about the wheels. But I have most of the other parts you mention. I have a NOS ultegra 6500 long cage RD, a NOS ultegra 6500 FD, 9 speed bar end shifters, the 9 speed 12-27 cassette. I am still considering making this a triple, but her Turbo is already a triple. To me, the reason to go 9 speed is that the 12-27 cassette gives her three more upper gear options without losing any lower gear options. Plus, she likes the bar ends, and I have those already. I just really had not decided what to do about wheels to get me there. The 9 speed cassette was not going on the original wheels for obvious reasons. Check out eBay. There's a guy on there who's selling NOS Dura-Ace 7403 wheelsets (8/9 compatible) with Mavic Cii rims for $299 with free shipping. Last time I checked he still had a couple left. Hard to beat that deal. I picked up a set to replace the tubular DA wheelset on the '86 Paramount that I just bought (it's already an 8 speed and set at 130). Cost was about the same to buy a set of good clincher rims and spokes and have the LBS swap out the hubs and true the wheels, but now I have these lovely tubulars to sell and defray part of the cost of the new clinchers.